Ḥazzan in Munich, Bavaria; born toward the close of the eighteenth century. He was the predecessor of Solomon Naumbourg, afterward chief cantor of Paris. 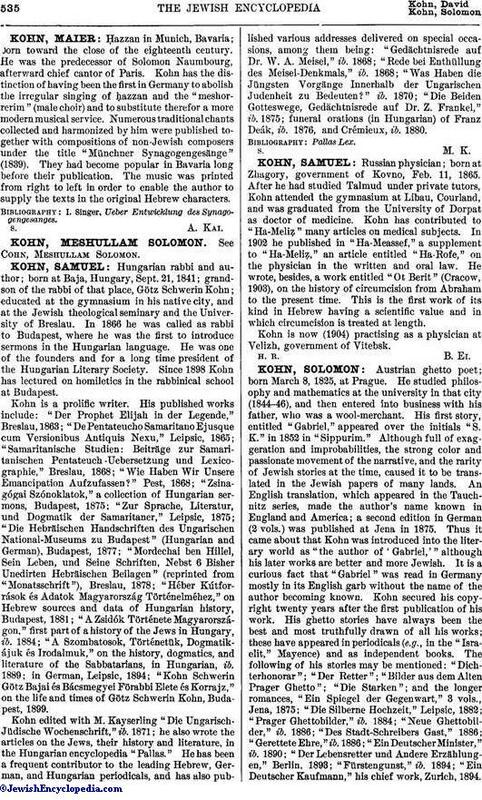 Kohn has the distinction of having been the first in Germany to abolish the irregular singing of ḥazzan and the "meshorrerim" (male choir) and to substitute therefor a more modern musical service. Numerous traditional chants collected and harmonized by him were published together with compositions of non-Jewish composers under the title "Münchner Synagogengesänge" (1839). They had become popular in Bavaria long before their publication. The music was printed from right to left in order to enable the author to supply the texts in the original Hebrew characters. I. Singer, Ueber Entwicklung des Synagogengesanges.